Max writes about what makes the VISITOR in Blackwood Grove, designed by him and Mary Flanagan, unique. 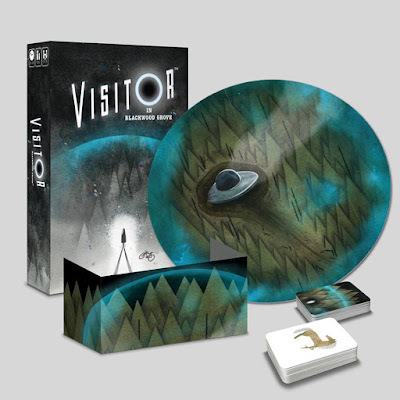 VISITOR belongs to a very small subgenre of tabletop games that to the best of my knowledge doesn’t have a name. I’m going to call the genre “rule-making games.” Games like Looney’s Labs’ Zendo, the classic Hasbro game Mastermind, and the playing card game Eleusis are all rule-making games. These games share one central mechanic: one player makes up a rule, and the other players try to figure out that rule by testing it. Beyond that, rule-making games vary in two key qualities: how much freedom the rule maker has when creating her rule, and whether or not the rule-maker has a way to win. For years, Mary and I had wanted to create a rule-making induction game, but before we started designing VISITOR in Blackwood Grove, we wanted to analyze several other games in the genre to see what they did well and how they could be improved upon. 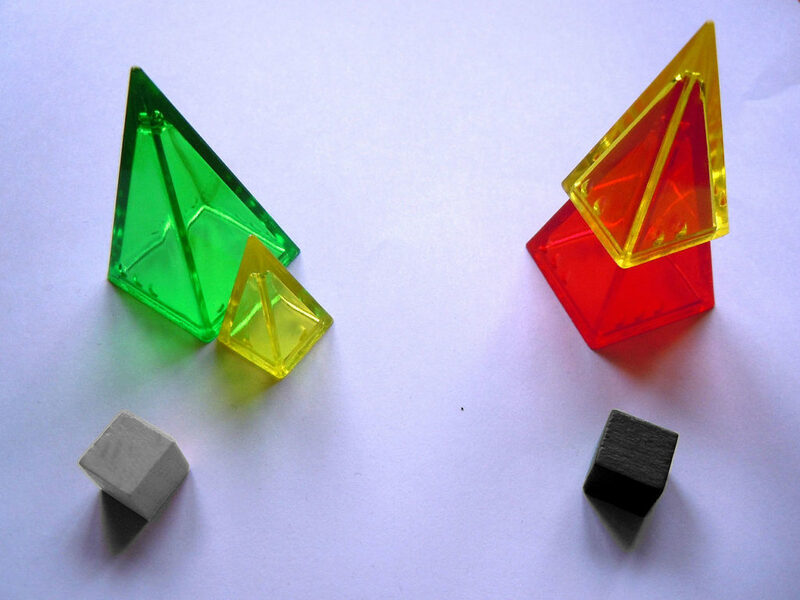 Zendo is a game by Kory Heath, played with Looney Pyramids (plastic pyramids), but can really be played with many different objects: legos, wooden cubes, etc. In Zendo, one player is the master and makes up a rule. This rule says which kinds of configurations of pieces “have the Buddha-nature.” The goal of the other players (the students) is to figure out the rule. They do this by making configurations of pieces and guessing whether or not they follow the rule—if the student makes a correct guess, they are rewarded with the ability to guess the rule on a future turn. Whether or not they guess correctly, their configuration of pieces is set out and marked whether or not it follows the rule. Zendo has a noncompetitive rule maker—the students are competing to figure out the rule, but the master herself cannot win; she simply wants to make an interesting rule. That said, the master has a lot of leeway in the rule she makes. Rules can be about number (“configurations with an odd number of pieces”), color (“configurations that include at least 1 green piece”), arrangement (“configurations that have exactly 2 pieces touching”), and much, much more. When it comes to these two central qualities of rule-making games (competitive rule maker and freedom the rule maker has), Mastermind is at the opposite end of the charts. In Mastermind, the codemaker arranges 4 pegs of the colors of his choice in the order of his choice. The other player (the codebreaker) tries to figure out the codemaker’s configuration of pegs by making guesses in the form of 4 pegs of the colors and arrangement of her choice. Each time the codebreaker guesses, the codemaker gives her feedback by divulging how many pegs are the correct color in the correct location, and how many pegs are the correct color but not in the correct location. The codemaker wins if the codebreaker cannot figure out the peg arrangement after a certain number of turns, and the codebreaker wins if she figures out the peg arrangement in time. A Mastermind game halfway through play. Mastermind has a competitive rule maker, whose goal is to make a rule that is too hard for the other player to figure out. 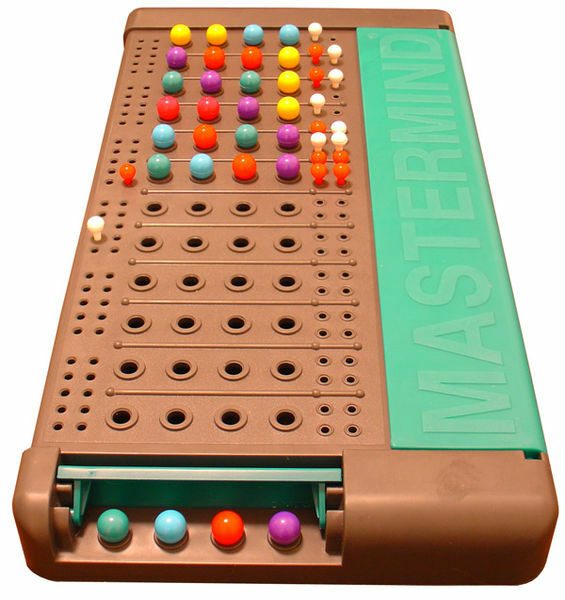 However, Mastermind gives its rule maker very little freedom to make his rule, since the rule can be nothing more than 4 pegs of different colors arranged in a chosen order. After looking at Zendo, Mastermind, and a bunch of games in the rule-making genre, Mary and I came to a realization: games in this genre either gave their rule makers freedom to make any sort of rule but didn’t let them win, or the games let the rule makers win, but severely constrained their freedom when it came to making rules. On one hand, we really liked giving players the outlet for creative expression that is freely making up a rule. On the other hand, we thought it was very important that everyone who’s playing the game can win; modern board game players often feel that if they cannot win, they are not actually playing the game—this is why games like Werewolf are doing away with the role of the moderator who cannot win. The central challenge in designing VISITOR in Blackwood Grove was: how can we create a rule-making game where the rule maker can win, but the rule maker also still has lots of freedom to make her rule? "The central challenge in designing VISITOR in Blackwood Grove was: how can we create a rule-making game where the rule maker can win, but the rule maker also still has lots of freedom to make her rule? Are Freedom and Winning Mutually Exclusive? So why do rule-making games either give the rule maker freedom or let her win, but not both? Imagine Zendo, but the rule maker wins if she can stump the other players after 12 turns or so. Because the rule maker has so much freedom in Zendo, it would be really easy for her to win: the rule maker would just make a really hard compound rule (“configurations with an odd number of green pieces, and pieces pieces that are both upright and lying down, and with no pieces touching”) that the other players will never be able to guess. The Zendo version where the rule maker wins by stumping the other players is boring for the rule maker because there’s no skill in creating a good rule; a good rule is the same as a long rule. This version is frustrating for the other players because they will never guess the rule in a reasonable amount of time. The Zendo version where the rule maker wins by getting someone to guess the rule is boring for the rule maker because she’ll just want to make the same rule every game, it’s boring for the other players because it takes very little thought to guess the rule. 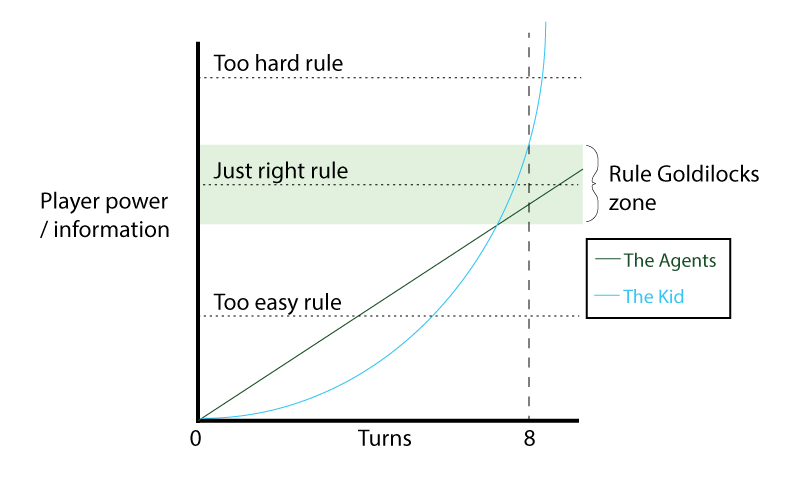 In order to solve our challenge, we would need to design a system in which the rule maker won by making a rule in the goldilocks zone: not too easy, but not too hard. This section assumes that you have a basic knowledge of how VISITOR works. If you don’t you can quickly scroll through the Kickstarter page here to get a sense of how it’s played. The solution that we stumbled upon after years of on-and-off prototyping was, as many things are in design, obvious in retrospect. You put the rule maker (in our case, the Visitor) on a team with one player (the Kid) such that they both win if the Kid guesses the rule before 8 turns are up. The 8 turn limit makes sure that the rule maker doesn’t make a rule that’s too hard. But what’s preventing the Visitor from making a rule that’s too easy? Enter the Agents. The Agents are opponents of the Kid and the Visitor, and the Kid-Visitor team loses if the Agents guess the rule. The two-team system makes it dangerous for the Visitor to make a rule that is too easy, because the Agents could very likely beat the Kid to the solution. There’s a missing piece of the puzzle, though. Up until this point, if the Visitor makes a bad rule (too hard) then her team loses, and if the Visitor makes a good rule (not too hard), her team has a chance to win. We really wanted the Visitor to have to think about the difficulty of her rule. We wanted a skilled Visitor to be able to make a rule that all but guarantees her victory. To this end, we introduced an asymmetry in the way the the Kid and the Agents get information. In VISITOR in Blackwood Grove, information is power—the more (and better) information you have than your opponents, the more likely you are to win. In the game, the Agents gain private information at a steady rate, up to 1 card per turn. At the start of the game, the Kid gets no private information each turn. This means that a rule that is too easy will almost certainly be guessed by the Agents before the Kid. However, by the end of the game, the Agents are still gaining 1 card of private information per turn, but the Kid has progressed along the trust track and is getting 2 cards of private information per turn, as well as being able to reveal some of the Agents’ cards. Because the Kid ends up getting information faster than the Agents by the end of the game, a perfect rule is one that takes the amount of information that the Kid has on turn 8 to solve, and thus cannot be solved by the Agents who have been surpassed by the Kid at that point. As with all good things, this whole dynamic can be boiled down to a graph! 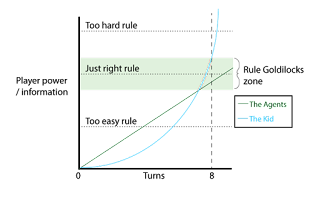 In this graph, you can see that the Kid’s power starts off growing slowly and then grows faster and faster (as trust increases) until it surpasses the Agents’ power. The horizontal lines represent the amount of information needed to solve any given rule. Rules that fall below the Goldilocks zone are too easy because the Agents will accumulate the information to guess them before the Kid does. Rules that fall above the Goldilocks zone are too hard because the Kid won’t accumulate enough information to guess them before turn 8 and the end of the game. The Goldilocks Zone is defined by the power level at which the Kid’s line crosses the Agents’ line on the bottom, and the point at which the Kid’s line crosses the 8 turn mark on the top. Of course, the Kid wants to increase the steepness of her line by gaining trust faster, and the Agents want to increase the slope of their lines by choosing the smartest cards to test. In addition, since different players will be better or worse at spotting patterns in the public information, a rule might require different amounts of information to solve for different players. The Visitor is trying to predict all of these variables (how fast the Kid will gain trust, how useful the cards in the Agents’ hands will be, and how good each player is at spotting patterns) in order to make the perfect rule. This is a hard task, but a fun one because it feels really good to get it right. There was one remaining problem with our design concept for VISITOR before we had solved the challenge of integrating a win-state for the rule maker with freedom for making rules, and that was how to guess the rule. In games with high freedom for the rule maker, like Zendo, it’s completely fine for the players to use a verbal guess for the rule, and in my experience games of Zendo always end in the rule maker saying “Your guess is close enough.” The problem is that in competitive rule-making games, it’s very tempting, when there’s any subjectivity, for the rule maker to rule in her own favor. For example, in VISITOR if the rule was “things that weigh more than 100 lbs.” and the Kid guessed “things that weigh more than 75lbs.” in many cases it would be very easy for the Visitor to just say “yes” and win. To solve this, players in VISITOR don’t guess the rule—they prove that they know the rule. They must show that they know which objects follow the rule and which ones do not at the same time as the Visitor so that neither can cheat. This means that a rule like “things that weigh more than 100 lbs.” becomes “things that are heavy,” and I consider this a great design feature because VISITOR is much more fun when you’re trying to spot the patterns between the objects, and not just to guess an arbitrary number in the Visitor’s head. Proving the rule as opposed to guessing it also has the added benefit of discouraging rules that are too inclusive (things that are lighter than a feather) or too exclusive (things that are heavier than a feather). These rules aren’t fun to play against as the Kid or the Agent, because with every card in or out there simply won’t be enough information to figure out the rule! Proving the rule as opposed to guessing it means that a rule that is too inclusive or too exclusive can be immediately proven by the Agents using brute force (“every card so far has not followed the rule, so I will simply prove the rule and say all of the cards are out”). I hope this has given you a sense of how VISITOR in Blackwood Grove is unique, even when compared to the rule-making games that are most closely related to it, and the thought that went into crafting the mechanics the way that we did!